With the UK’s Srebrenica Memorial Week coming to a close, we reflect on the hundreds of events which have taken place across the country bringing together thousands of people from all different backgrounds. These have been organised by the 1,200 Remembering Srebrenica Community Champions to mark the 23rd anniversary of the genocide in which over 8000 Bosnian Muslim men and boys in Srebrenica were systematically murdered on account of their Islamic faith. We also remember the thousands of women who were tortured and raped as part of the campaign of ethnic cleansing which took place across Bosnia-Herzegovina. 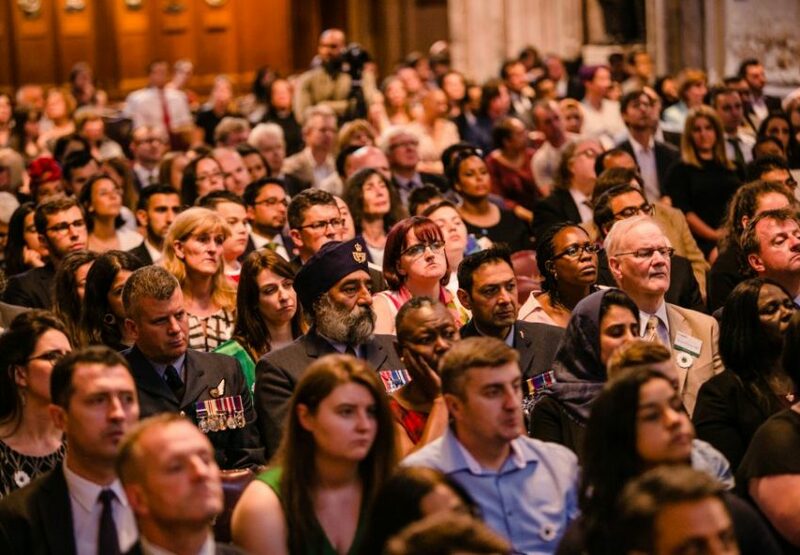 Events have taken place in Mosques, Churches, Synagogues, local authorities, women’s centres, schools, universities and community centres across the UK in order to bring people together in collective acts of remembrance and to reaffirm our commitment to standing against hate, here in her the UK. We were privaliged to be joined by genocide and ethnic cleansing survivors Nusreta Sivać, whose testimony helped secure convictions for war criminals like Ratko Mladić, and Dr Ilijaz Pilav who was one of five doctors stationed at Srebrenica hospital during the genocide. They both shared their powerful stories at the UK’s National Srebrenica commemoration at The Guildhall, London on 11th July. “I am proud that the Ministry of Housing, Communities and Local Government has been able to support the work of Remembering Srebrenica in all that it has done to commemorate the genocide in Bosnia but also through its work in the United Kingdom. Courage comes in many forms. Whether that is the courage to speak out against murder and sexual violence, the courage to protect one’s neighbours, the courage of survivors to give their testimonies. Without these acts of courage, we may never have known the full scale of the atrocities committed 23 years ago”. There are still memorial events taking place throughout the month of July as Community Champions continue to share the stories from Srebrenica and honour the victims of genocide. Remembering Srebrenica are grateful to all those who helped to commemorate this important anniversary and stand up to hate in all its forms.